An 11-player Thai crew gears up for the Solaire Philippine Open next month, all aiming to finally break the long spell and nail the elusive crown in the country’s premier championship at the dreaded The Country Club in Laguna. 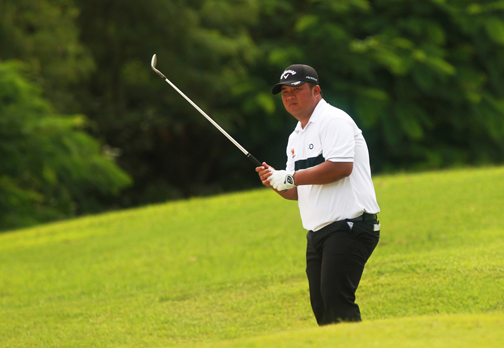 Prom Meesawat nearly pulled off the feat in the event’s Centennial staging last year when he stormed to the lead after three rounds of play in brutal conditions. But the veteran Thai campaigner took a heartbreaker of a defeat to local ace Miguel Tabuena, losing in sudden death and extending the country’s perennial regional rivals’ woes in Asia’s oldest National Open. That could change as the likes of Wisut Artjanawat, Namchok Tantiphokakul, Sutijet Kooratanapisan, Pasavee Lertvilai, Nirun Sae-Ueng and Poosit Supupramai vow to accomplish what Meesawat had failed to achieve when the 101st edition of the fabled event is fired off April 3, also at the Tom Weiskoph-layout. Tabuena, now busy campaigning in other regional tours in pursuit of world ranking points, will be back to defend the crown, along with the other Filipino top guns and aces from 13 other countries making up the early 92-player field in the 72-hole championship sponsored by Solaire Resort & Casino. More bets, including new, crack international players, are expected to sign up in the next few days with the organizing Pilipinas Golf Tournaments, Inc. guaranteeing another down-to-the-wire finish on a course whose signature final hole could make or break one’s title bid. Ten Australians, led by Philippine Golf Tour Asia leg winners Damien Jordan and David Gleeson, and 11 players from the US, headed by regular local campaigners Sam Gillis, Lexus Keoninh, Brett Munson, Cory Oride and PGT leg titlist Nicholas Paez are also in the fold, all seeking to get a crack at the coveted crown in the event sanctioned by the National Golf Association of the Philippines headed by president Martin Lorenzo. The event also drew bidders from Colombia, Indonesia, New Zealand, England, India, Korea, Indonesia, Japan, Spain, Macedonia and the Netherlands plus the leading local players on the both the PGT and PGT Asia circuits. Juvic Pagunsan is also seeing action as one of the invitees with Asia’s former top player all primed up to shoot for the one championship missing in his trophy collection. He actually tied for second in 2004 at Riviera as an amateur, bowing to American Edward Michaels in the end.